Even though it’s not officially summer, we are in full-swing summer mode in our home. We’re doing all the summer things we love so much: swimming, grilling out, fishing, walking at the park, and staying up late to catch lightning bugs. Vacation Bible School planning is in high gear, and we’re looking forward to that next week. 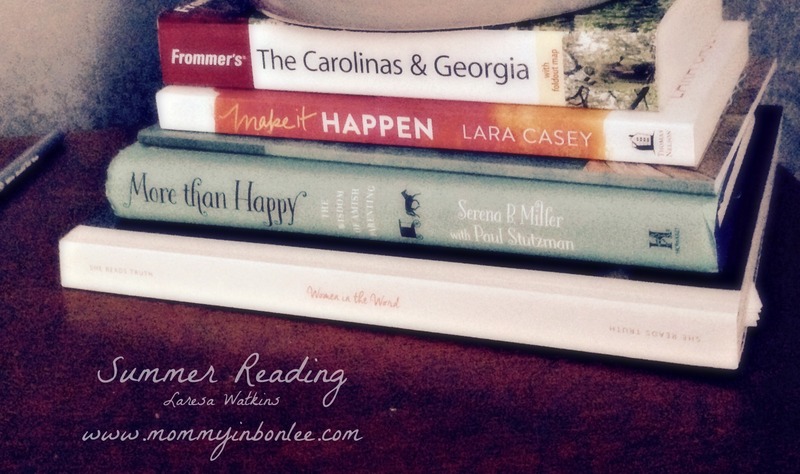 To me, a big part of summer is reading. I guess this is something I developed when I was teaching, when I would have summers off all to myself and was able to spend lots of time reading. Now that I have children, I don’t have too much time to read (and I certainly don’t get to read by the pool or laying on the beach like I once did), but I do like to read for a few minutes at night, until I can’t hold my eyes open any longer. Or, on a stormy summer day the kids will watch a movie while I read. 1-The summer Bible study from She Reads Truth. It is called Women in the Word and it is 9 weeks of learning all about women in the Bible. I love reading about real women with real struggles and how God helped them through, and I am also loving the pictures of modern-day women in the word that are sprinkled throughout the book. 2- Make It Happen by Lara Casey. This was the winter book club selection for The Influence Network and, while I am REALLY, REALLY behind on this book (the book club is over, for goodness sakes), I am enjoying it so much. It is very inspiring and motivating. 3. More Than Happy: The Wisdom of Amish Parenting by Serena Miller and Paul Stutzman. I believe in a simple, peaceful life, which is what this book is about. This is the book I am looking forward to reading every night. 4. Frommer’s The Carolina’s and Georgia. I always keep this travel guide in my nightstand just in case we’re going somewhere close by, but I have it out this summer since we’re traveling to The Outer Banks for our beach vacation next month. Charlie and I are also reading the first book in the Harry Potter series, which is so exciting to a book nerd like me. We are spending a little time each night reading it, so it will probably take us the good part of the summer to complete it, but I sure am enjoying it. It’s been awhile since I read the first book, so it’s like reading it for the first time all over again.